I have a new love. It’s called poetry. I have an old love. It’s called poetry, too. They are finally meeting one another, in the space of my mind. why have I not saved the moth? and delivered her to the sharp blue air? I tend to put poetry in the same category as fine art and wine — things about which I know next to nothing, except whether I love them or don’t understand them at all. I do have books of Dickinson, Rilke, Whitman, Derek Walcott, Loren Eiseley and Mary Oliver on my shelf, but I rarely pick them up (though I sometimes claim that Mary Oliver saved my life). About three years ago, I tried out a suggestion to do something I love before doing anything else upon waking each morning. The thing I chose to do was read a poem. Sometimes I remember this suggestion, and when I do it makes a difference, but mostly I forget. And it’s true that I am always stopped short by haiku, perhaps because the astonishing simplicity of a very short poem creates the same feeling inside me as a peerless line of prose. Both can make me stop and look up at the world with new eyes, or make me close my eyes and roll the sounds and feelings of the words around inside my mouth and mind. But poetry, god forbid, has never been something that I do. In fact, when I met a new friend last year to discuss my leap into creative writing, she said, “At least you’re not a poet!” We laughed. Whew! At least I’m not a poet! Because now I am writing a poem almost every day (and sometimes in the middle of the night). At the end of April I attended a day-long workshop on poetry and meditation with John Tarrant, Roshi, who is both an accomplished poet and the director of my Zen center, the Pacific Zen Institute (PZI). I almost didn’t go, but something pulled me there. PZI is committed to the (inevitable) fusion of koan study and art, no matter what such a fusion might look like in an individual’s life — be it painting, music, poetry, worklife inspiration, or something completely, breathtakingly new. After my first time in retreat with the community, I went home and told my husband, “There is such a huge, open-hearted trust there in each person’s light — like nothing I have ever experienced before.” Why wouldn’t I want to go hang out in such a place, with such people, and with poetry, too? So I went. And the most mysterious thing about that whole day is that I was already writing poetry on my way there. It’s like you start the journey as soon as you decide to make it. As I drove down my mountain road, and made stops at the library to drop off books and the post office to mail a letter, I was washed by an internal lilt of words and a wondrous freshness of vision. The whole world felt like a poem. Six gulls lift from the library parking lot. circle the high school football field lights. the liquidity of air is in sight. And since that day, this feeling hasn’t really stopped. A walk in the woods, a trip to the dentist, dark places in my memory — they all feel like poems happening in real time. 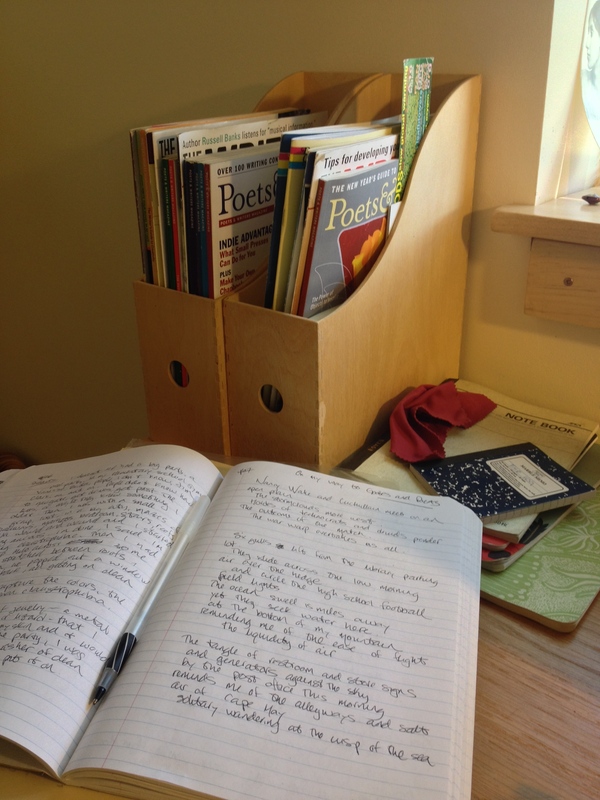 I know I have a lot to learn about the craft of poetry, and the way it may or may not continue to weave itself into my writing and my life, but for now I am savoring the reawakening of an old love, and my wide-eyed beginner’s mind. Thank you so much, Nina. I hope we can share in person some day! And I love what you said about the moth wanting “to survive all over again.” That’s exactly how I am feeling, these days. Thank you Amy – I feel like I have had a real connection with you and with myself. Thanks for sharing – thanks for writing. You are very welcome, lovely Penny! The title of your blog is also a poem! I love this. Mwah. Thank you, Megan. I actually had the title of the blog in my mind for at least a year before beginning to write it. Just like I said – it’s like you begin the journey as soon as you decide to make it! First, congratulations on your poem being published online previous to your forthcoming published poem on Rattle for their “Poets Respond,” to new news. I’ve read it and it touched me so very deeply. I’ve two children. A boy and girl. Although, my daughter is a newly minted college graduate, 22, phew, and my son finished his junior year in high school, I felt a connection to that senseless news and your delicate and fearful response to it. I relate to you. I never post comments on peoples personally blogs even though they’re public. Get ready. You’ve an amazing career in front of you. I’ve tried to live my life in a Zen moment to moment with detours in the road: poor choices and current health issues. You are an inspiration to me and others as it appears. Submit. You’ve earned accolades that come your way. My wish is that I could communicate with you. I write as well. Peace!